We don’t often think of birds as individuals – even those who watch feeders closely can have a hard time distinguishing between our regular visitors from season to season. Those who band and monitor shorebirds, however, have an advantage in that individual birds, bearing recognizable markers on their legs, can be followed. In fact that’s the whole point, providing a birder with the necessary optics and knowledge can decipher the code and get the information where it needs to go. And when it all works the way it’s supposed to, some incredible narratives emerge. Take, for instance, the story of B95, a not outwardly notable Red Knot among thousands that famously stop over on Delaware Bay to load up on horseshoe crab eggs before departing to the tundra as they have for millennia. 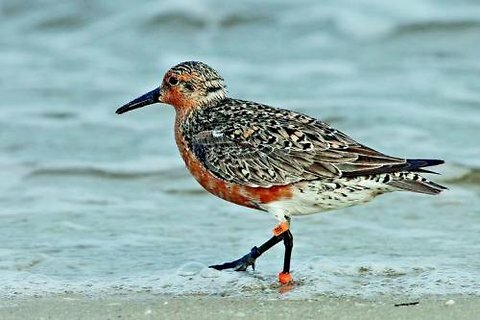 Except that because of the slip of plastic on the birds leg, we know that B95 has been visiting this stretch of shoreline for at least 20 years, making him the oldest Red Knot known, and a front-runner for oldest shorebird. That’s amazing enough, but in B95’s lifetime it has flown approximately 20,000 miles a year – from Argentina to the Canadian tundra and back – for at least 20 years, putting an estimated 400,000 miles on those wings so far. And remember, he was initially banded as an adult so this is likely a conservative estimate. It’s a fascinating look at shorebird migration through a indomitable character.